Sandy soil plus trees that steal moisture (maple, linden, pine) equals dry shade: my big garden challenge. 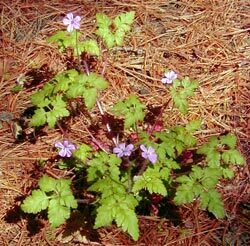 When I heard of an unusual geranium that thrives in these conditions  Herb Robert, Geranium robertianum  I went to some trouble to find it. I planted it in our pine woods, where I've cleared out the understory of scrubby saplings, and am working on getting a more interesting plant community established. It took readily, and the next year had self-seeded many babies, dotting the carpet of pine needles with its light green, fern-like leaves and tiny pink flowers. This plant started in Europe, Asia and North Africa, but is widely established on our continent now too. However it has no natural enemies here. It was probably brought over by early settlers for its medicinal properties. But it's delicately pretty, too, flowering from May to October; in fall, the leaves turn bright red. In my dry woods the plants are open, with leaves widely spaced, so they intermix well with other plants I've managed to get established there like sweet woodruff, partridgeberry, and foamflower. However in the richest, most moisture-retentive soil in my garden, one plant is husky and thick, and crowds out the Johnny jump-ups around it. In moist Washington State, it's choking out other understory species, and regarded as an invasive weed needing control. In Oklahoma, a nursery offers seed for sale in bulk on the Web, as do others located in the UK. Like the Johnny jump-up, it's not reliably hardy, but it is prolific. In fact sources disagree on whether it's an annual, biennial or perennial. I could swear some of my plants have lasted more than one winter, but I'm going to mark a couple to keep track so I can find out for sure. I love how it's spreading around my yard, can't get enough of it! Its roots are shallow and not extensive; so it's easy to pull up an unwanted plant. Still I worry about its getting into Howard Park; especially the moist areas by Hawthorne Brook and the Squannacook River. In Washington State, it grows so thick and extensively that pulling it up is not practical. None of the sources I found mentioning it in the Northeast, however, called it invasive. In fact in Canada, the Federation of Ontario Naturalists suggests it as an alternative to invasive ground covers like periwinkle. The Connecticut Botanical Society lists it as "native"